The INS Student/Postdoc Essay Contest aims to promote interest in neuroethics among students and postdocs early in their academic careers. The contest is open to all post-secondary students enrolled in a degree-granting program at the undergraduate, graduate, or professional level. For the past two years, winning essays have been selected from two categories: academic and science communication. 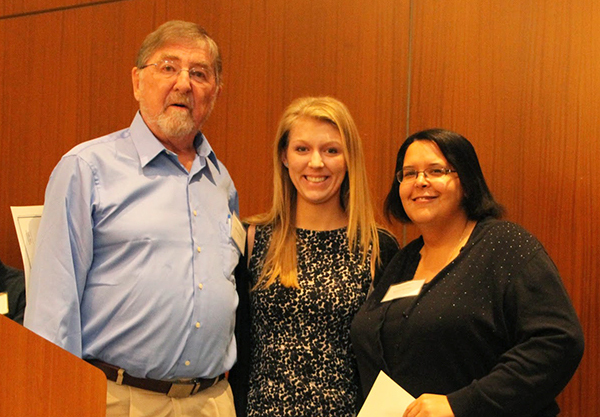 The 2016 INS Student/Postdoc Essay Contest winners Kaitlyn McGlothlen and Monique Wonderly, center and right, received an award and stipend presented by Dr. Michael Patterson, left. The essay contest is organized annually by the members of the INS Student/Postdoc Committee and supported by Dr. Michael Patterson. The call for essays is usually announced in March, submissions are accepted through June, and the winners, announced late summer, are invited to receive recognition at the INS Annual Meeting in the autumn. The essay submission deadline for this year has passed, but we encourage you to review the format and requirements in the call for essays to prepare your future submissions. discussions that further this growing field.